Waking up at our basecamp on the McKenzie River at Belknap Hot Springs was chilly this morning, but the incredible feel of being surround by tall old growth trees and the sound of the rushing river made for a true wilderness camping experience. All five stages in the Old Cascade Crest Network today were completely new to the event – and required a lot of pedalling. This yearlong project for the Trans-Cascadia crew allowed the race to add the 17.8 miles with 3,667 feet of climbing and 5079 feet of descending. Stage 8 started with a climb towards Browder Ridge where the mature timber gradually gives way to open meadows along the ridgeline where – had the clouds lifted at all -racers would have had views of the surrounding volcanoes. From there, the stage dropped promptly down Gate Creek Trail for a sporty descent to a challenging final plunge. 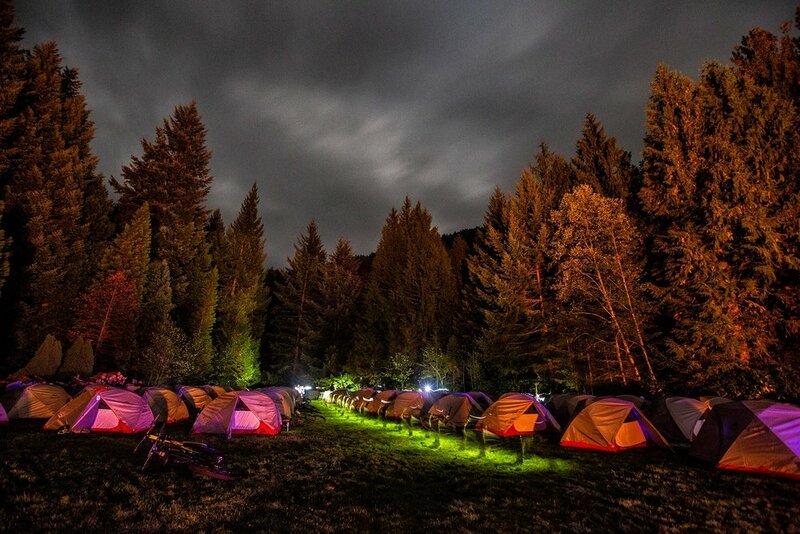 After a short shuttle, racers arrived to Crescent Mountain for stages 9 and 10. The South Crescent trailhead required some effort as it was a roughly 1 - 2 hour climb. Racers were promised a reward of sweeping meadow vistas just before the summit, but all were happy with the stunning and misty old growth forest along the way. Stage 9 sent racers down the north side of the mountain. This ‘dark side’ delivered consistently fast speeds into turns that felt handmade for mountain bikes, despite the vintage of the trail. That said, not all the corners were easy to make – at least not a mach speed. I was like “Joe, are you okay?” And he yelled back “yeah, I’m fine!” And I was like “no, are you sure? Like are you really okay? That was the gnarliest crash I’ve ever seen.” And he was like “yeah, I’m fine.” So I run down and he’s like trying to hike out and the first thing he says is “well this is really going to hurt my time” and I was like “dude! You almost just died.” So I pulled his bike out and set his levers straight and he kind of shakes it off and he’s asks if his bike is good to go and I was like “everything looks right.” And he just grabs it and takes off sprinting. The rest of the day, I was like, ‘you know what? I like the slower speeds.’ I made all the turns and just like chilled out. Yeah, it kind of freaked me out. After a mid-mountain pause – which was needed for most to gather their composure by the sounds of it, Stage 10 was a playful rip down to the creek. Stages 11 and 12 were off the mountain on South Pyramid Creek Tail. The course meandered down the creek with a short neutral climb for a chance to regain any lost composure before dropping back in. Following a quick transfer up road, racers continued on the quite physical South Pyramid Creek Trail through an ever-changing landscape and finally onto the fast bench-cut section to end the day! 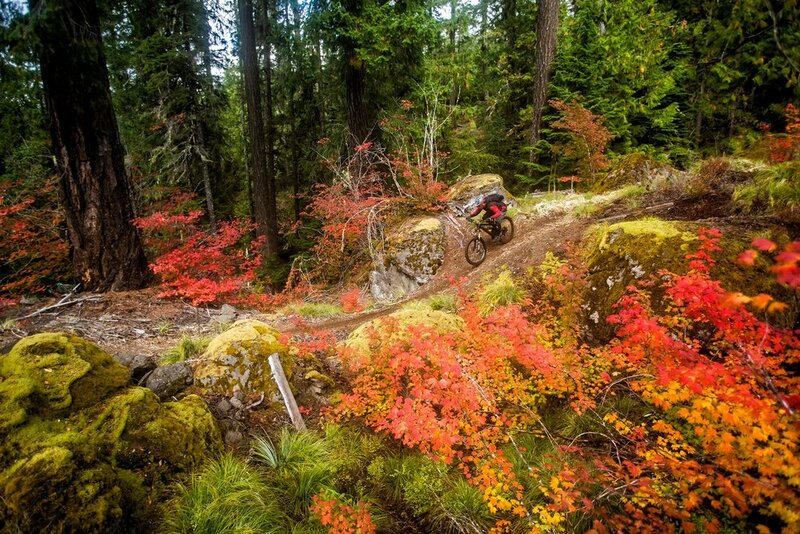 “It’s nice to do some new trail again” Geoff is the returning 2016 Trans-Cascadia champ. We got out there! I’m interested to look at a map afterwards to see where we actually rode. It’s amazing these trails feel like we are in the middle of nowhere, but they are so buff.” Geoff’s strength with pedalling came into play today as he closed the gap between him and Chris Johnston; who is currently in first place. 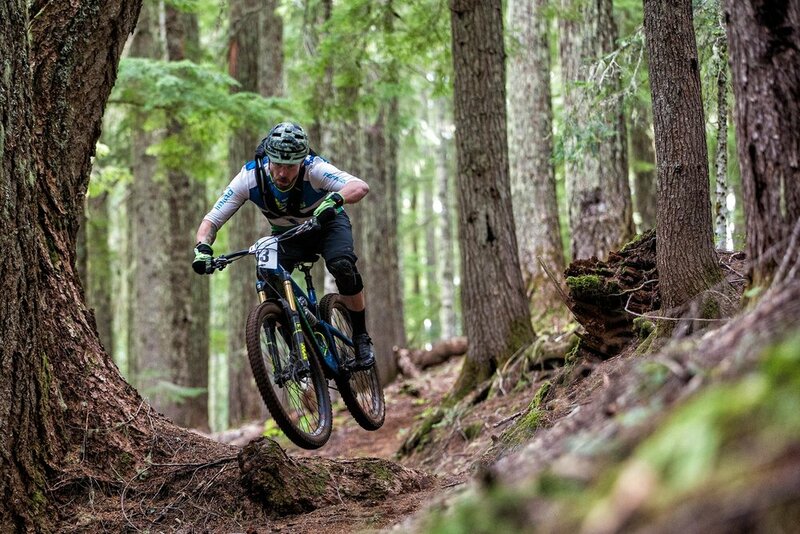 Racers experienced some true northwest weather yesterday, but at the end of the day there were nothing but smiling – albeit tired – faces and loamy bikes.